Hey guys TWITCHDJGANDALF_ here ! As I have experienced yet, a lot of players prefer to gain the opportunity to compete each other; so that means they are interested in having more "Competitive Content". I personally agree with that, so I figured LET'S DO OUR OWN CUP aswell! Because I do not want to talk long around the bush let's get in started directly! Of course there will be some GD added too! - Every single match will be controlled by selcted referees, so they will always have the opportunity to exclude you from the tournament if you or your team is acting against the rules! - The teams of the certain groups will be picked completely random, so even the registration process won't have any influences on the teampool at all! - In the GROUP STAGE the teams have to play the mode Best of 4, so that means you can also get a draw next to a win or a lose situation! - Short explaination: A win gives you 3 Points, A draw gives you 1 and a lose gives you 0. - So how should that work? Just like in football every team has to play against each other in one group, so that means you will have 6 matches for EACH GROUP in total! - How does a team qualify for the BRACKET STAGE? After the 6 matches the first two of each group will be overtaken in the BRACKET STAGE! Because of the fact that a draw is possible, there can be a lot of many difficult situations at the end of the GROUP matches. So the question is now, which team has qualified for the BRACKET STAGE next to TEAM A? It is a little bit complicated because Team B and Team C are having the euqal number of points. In such a case the referees will be deciding which team will come further based on the fairplay principle. If you cant still draw any conclusions of the fairplay system it will be randomized which team will hit the next round respectively the BRACKET STAGE. - After the GROUP STAGE has completed the final 8 left Teams have to compete each other in the BRACKET STAGE. - The BRACKET STAGE is based on a simple KO System, so that means if you have lost you will be automatically kicked out of the TOURNAMENT. - The BRACKET STAGE playing mode will be Best of 3, so no draw will be possible there anymore! - After the BRACKET STAGE is over there will be also a match of the 3rd place. - Your team has to appear punctally and completely if you are having a match appointment! - If your team is not appearing completely after 15 minutes of the original appointment you will get disqualified! - You always have to follow the instructions of the referee, if you dont you can get disqualified! - Entering roofs is not allowed! Hint: Car roofs are allowed except of the caravan! - One Team consists of 5 players! - Allowed Shields: Every kind of shield/barricade is allowed, but just a maximum amount of 5 Shields! - Allowed Attachments: Every single attachment is allowed! - Any other items that are not listed here are automatically not allowed!!! Just copy that and fill in and repost it under this topic post. After 16 teams have registred I will begin to organize every single appointment which is necassary for the certain matches.In this regard and in order to do that I will contact both leaders and talk to them if they appointment is possible or not. If something comes in between and you suddenly cant appear to the arranged appointment contact me at the latest 2 hours before the match would start! So guys I think that was a lot of input so far, thank you guys for your attention to read that stuff and I hope we will have a great time together while doing that tournament!!! Wow! I love to see this effort by our community, great work man! Good luck with the tournament! Alright guys! 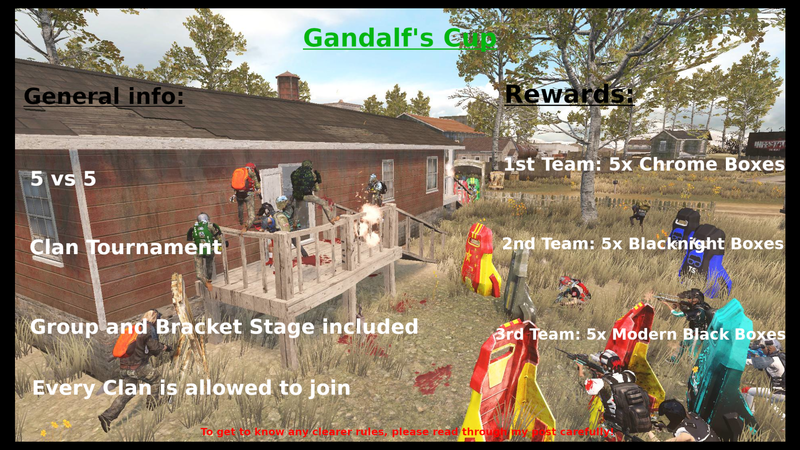 We are already having half of the required team amount enlisted in the Cup. Now we have to go for the left 8 Teams!!! we couldent get 5 players. Team Name : HIGH & Hungry Asia. Alright guys, 5 Teams are only left till we can start! Just go for the last 5 registrations!! !